Use Companies and Groups to make sure everyone is in the right place, and to make invitations and notifications a snap! Only admins and the account owner can create companies. To add people to a Company, go to your "Everyone" page and click the "Make a Company" button. Name your company and add users. As you type names, Basecamp will suggest people in your account. Only existing users can be added to companies or groups. Make sure you've added someone to your account before adding them to a group. Tip: Add new people to an existing company by clicking "Everyone," and then the company's name. Create Groups within your Company by clicking the "Add a group" link below the company. Give it a name and select the members. You'll need to add people to the company before they can be in a group. Here's a quick video to show you more! So your team is organized ... now what? Invite any company or group to a project quickly. Just type the company or group name in the invite field You can also send a notification to the entire company or group. 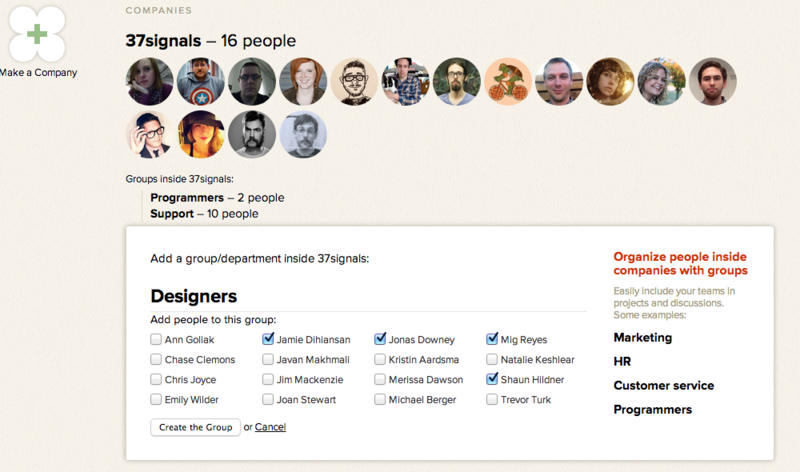 Basecamp Classic users will remember that Companies were used to organize projects. That's no longer the case. Learn more about organizing your projects.